The River Street Bridge is a bridge connecting River Street in Cambridge, MA to Cambridge Street in Allston, Boston, MA. 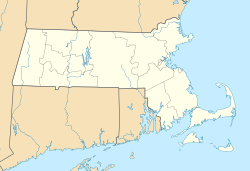 It was built in 1925 by the Commonwealth of Massachusetts Metropolitan District Commission. The bridge carries one-way traffic going east, into Cambridge. Westbound traffic must take the nearby Western Avenue Bridge. The old Cambridge Street Bridge in 1910. This bridge was demolished to make way for the current bridge. The original bridge at the site, a wooden drawbridge, was built in 1810. The bridge was built in response to the 1793 construction of the West Boston Bridge (at the site of the current Longfellow Bridge), because the two bridges together greatly shortened the route from Boston to Cambridge, which previously had to take a highway around the Back Bay through Roxbury. The current reinforced-concrete bridge was constructed in 1925 with three arches that span 330 feet. It was designed by Robert P. Bellows in a style resembling the Pont Neuf in Paris. ^ a b "River Street Bridge permanent illumination set for September". Allston/Brighton TAB. September 3, 2007. Retrieved June 19, 2011. ^ "Important Allston Brighton Dates". Brighton Allston Historical Society. Retrieved June 19, 2011. ^ "Harvard Avenue History". Brighton Allsion Historical Scoiety. Retrieved June 19, 2011. ^ "Accelerated bridge program: Western Avenue Bridge/River Street Bridge". Massachusetts Department of Transportation. Retrieved June 19, 2011. This article about a bridge in Massachusetts is a stub. You can help Wikipedia by expanding it. This article related to a building or structure in Boston is a stub. You can help Wikipedia by expanding it.